One of the common themes when speaking to pedestrian victims of automobile accidents is why they opted not to take an ambulance to the hospital directly after the accident. Their answer is almost universal: they do not want the large bill that comes with a ride to the hospital by EMS or private ambulance service. Although the No-Fault law has been with us for over thirty years, citizens in the State of Michigan are still ignorant of the fact that the ambulance ride to the hospital is, for all practical purposes, free. The idea of being a pedestrian who does not drive, and does not own a car being entitled to free medical when injured by a motor vehicle, is still something the public has not truly grasped. The statistics are staggering. In 2013, 4,735 pedestrians and 743 bicyclists were killed in crashes while nearly 66,000 pedestrians reported injuries. Statistically, this is one injury every eight minutes. With the advent of smartphones, and the unfortunate habit of texting while walking, especially across intersections, we can only imagine how these numbers will rise. With those rising statistics comes the devastating economic reality of being injured in a motor vehicle accident, creating huge medical bills and the inability to earn a living due to debilitating injuries. Thankfully, the State of Michigan has a sound No-Fault law that protects pedestrians and bicyclists from the severe economic effects of such accidents and injuries. Every pedestrian and bicyclist who is injured in a motor vehicle accident is entitled to full No-Fault benefits even if they have no car, never owned a car, or do not have a driver’s license. This is true for all men and women of any age. In the circumstances of a pedestrian who happens to own a vehicle with insurance, their No-Fault benefits including medical, lost wages, household services, and transportation to and from doctors is paid by the insurance they purchased for their car. However, if that injured pedestrian or bicyclist is not insured themselves or does not live with an insured relative, they will get their benefits because the law requires that the insurance company of the vehicle that struck them must pay all of their benefits. But what if the car that struck them does not stop, and it becomes a hit and run accident? Or, what happens if the car that strikes the pedestrian and/or bicyclist is uninsured? The law makes allowances for this also. THE STATE OF MICHIGAN WILL APPOINT AN INSURANCE COMPANY TO COVER THE PEDESTRIAN AND/OR BICYCLIST FOR ALL THE BENEFITS THAT THEY WOULD BE ENTITLED TO AS IF THEY PURCHASED THEM FROM THE INSURANCE COMPANY. Can you imagine? A person who does not own a car, maybe never owned a car, and has no auto insurance of their own, will now be covered just as if they purchased the insurance themselves. It is a terrific law and provides ample protection to the victims of motor vehicle accident who are otherwise uninsured. 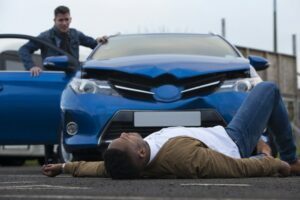 It is important that once a pedestrian or bicyclist is injured that they immediately report it to the police, and contact our Southfield accident attorneys who can adequately explain what benefits they are entitled to, who will provide them, and can assist the injured person in making the appropriate applications for those benefits. If an application is not made within one year from the date of the accident, then the injured pedestrian/bicyclist will be barred from collecting those free No-Fault benefits. We at Wigod & Falzon understand the law thoroughly, and can guide you and ensure that you get all the benefits that are required under Michigan law. Call us today for a free consultation. Remember, you pay us nothing if we do not recover for you!